Illy Caffé was established in 1933 in Trieste, Italy by Francessco Illy. When he founded the company, Francessco’s dream was to produce and sell the best coffee in the world. Illy Caffé has built on that dream and become the leading espresso coffee, enjoyed in over sixty countries. The company is committed to a marketing philosophy of “One Brand, One Blend”. Illy’s product is 100 years old so they have nothing new to say. They provide a beautifully designed coffee bar exhibit and talk with people. With a straightforward, no-frills offer, the Illy product becomes more accessible and the Illy message is easy to understand. That means that visitors are more likely to make the commitment to come into Illy’s trade show booth. Illy enjoys setting itself up against their competitors as they are confident enough knowing that Illy’s offer is, very simply, “the best”! Illy would much rather get two really top pieces of new business than 100 minor orders and everything they do is geared toward achieving that goal. It is important for aspirational brands like Illy to have a well designed booth presence at the show. Illy builds a coffee bar that is low-key and not unlike a VIP Green Room. It’s always well conceived and welcoming which means visitors return four or five times just to relax and unwind after trawling around the show. The ambience of Illy’s booth always attracts people who like the product – and nine times out of ten, will buy from them. Illy’s simplicity always overshadows the competition, most of which try too hard to produce something glamorous or seductive. However much they spend on something big and flamboyant, Illy’s simple approach always wins hands down every time. Prior to the show Illy invites people they know to visit them at their booth. To those who don’t know Illy, they communicate what they do and the aura of their product. Illy is lucky because coffee fills all the senses: sight, smell, taste, touch and hearing. It’s very tactile and the way Illy presents itself shows that they are and what they’re capable of. Illy uses the trade show as an opportunity to target the big prospects and would expect to convert three or four into long-term clients – that’s one of their objectives for participating in the trade show. Illy advertises in the coffee trade press. Illy’s Blog, Twitter, Facebook and Linkedin to let attendees know they are exhibiting. This involves only about four trade magazines but between the magazines and Marketing they reach all the right people. Its important for Illy to let clients and other prospects know Illy is going to be at an event, invite them to the booth to relax and chat with the salespeople. Illy runs an advertisement in the show catalogue because it has shelf-life and can be used for reference purposes until the next show. Illy likes to have their coffee served at events and parties connected with the show and that means maintaining a good dialogue with the show organizers. Show organizers know they can trust Illy to deliver a top product. It’s a win, win situation it’s good for Illy and it’s good for the show to be associated with a status brand as fine as Illy. Illy always add some PR and Marketing to their marketing activity in the run up to a show. Investing in a trade show means capturing all the associated opportunities and appearing in event previews is important. Illy researches trade shows thoroughly before deciding to take part. There is really only a couple of trade shows worth doing each year. Illy sees who else is there and checks out their competitors and what other high caliber brands are at the show. Illy takes a close look at the quality of the attendance figures and prefers shows that can provide genuine statistics and research. The kinds of satellite events that take place are also indicative of the quality of the show, as are seminars or workshops and the status of the people speaking at them. If any of these points don’t measure up Illy wouldn’t take part. All leads that Illy takes at a trade show, are monitored very carefully. Illy staff follow-up within a few weeks and builds on the relationship that was started at the show. 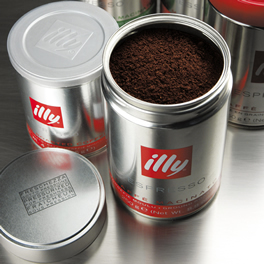 Illy would expect to convert a new lead to new business within about six months. Illy is always the benchmark standard of other exhibitors. If they’re good, Illy’s in the right place. If not, the exhibition generally doesn’t work for Illy in the long term. Again, it’s important to know that you’re spending your budget wisely and getting a return. If you do, you’ll go back to a show; if not you look elsewhere for a more meaningful result.